Possibly the easiest thing to cook in the world. Really. For not being remotely Italian, I’m a bit of a pasta freak, to put it mildly. I would eat it twice a day. But I don’t. I try to exercise a little restraint and maybe serve up some noodle-y goodness about once a week. And then I found this recipe and that resolution might go out the window. 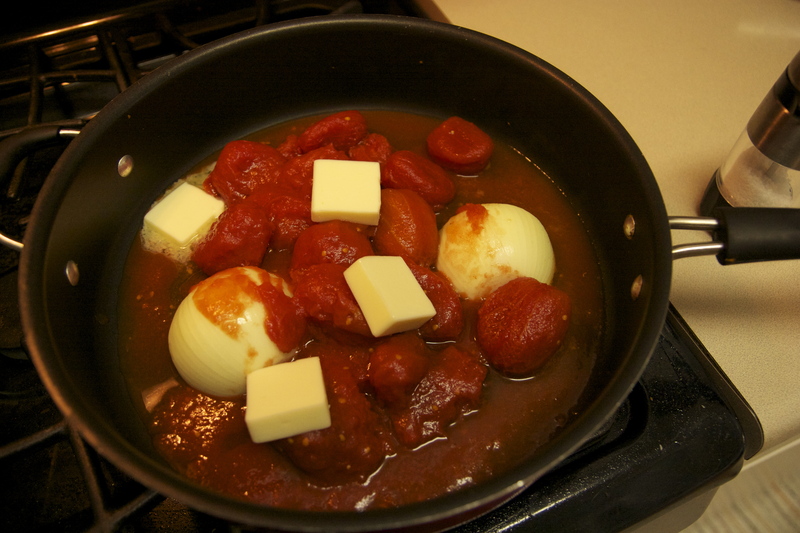 Basically, I was searching around for a bunch of other stuff when I came across Marcella Hazan‘s secret tomato sauce. In fact, I found it in multiple places, like here and here. They write a bit more eloquently about the subject. And for less than $2, I figured even if I hated it, I couldn’t go wrong. 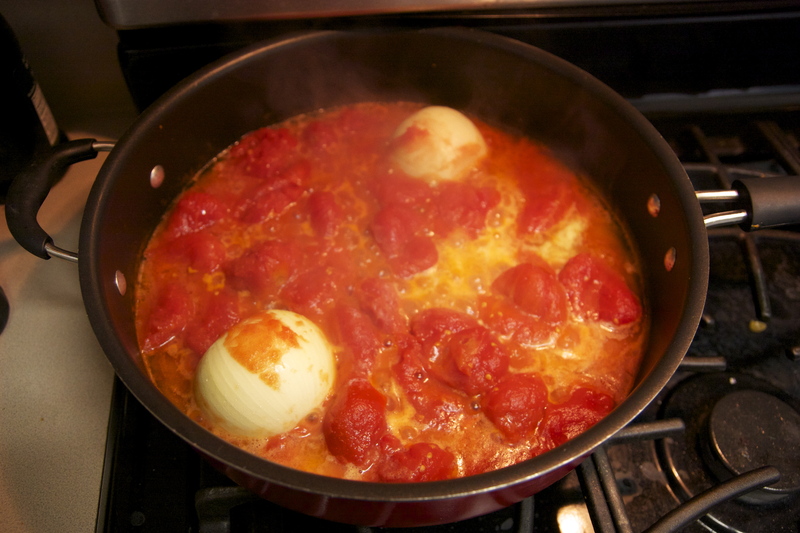 1-28 oz./796mL can of best quality whole, peeled tomatoes. Lip-smacking is a perfectly acceptable response. When the simmer was done, I just discarded the onions, checked the seasoning and then tossed with some spaghetti (and a little of the pasta water) that I set on the stove before the sauce was done. We topped with real parmesan and fresh cucumbers and green things from our container garden rounded out the plate. The verdict: An easy, velvety tomato sauce with highly addictive properties. That left me time to push my babies on the swing outside while it was cooking. You will do this forever.